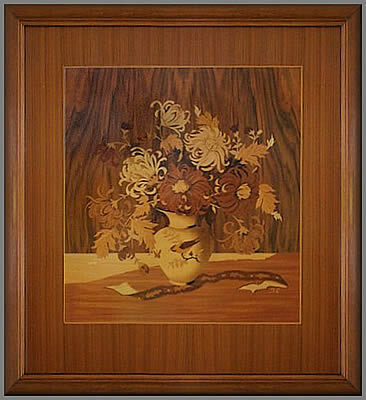 August's update tells a marvellous story of two young people's first encounter with Buchschmid and Gretaux Wood Inlay Work and their "lost and then found" adventures in acquiring their first wood inlay piece (they so very nearly lost out in purchasing this picture, being as it was Mr Buchschmid's last "hands on" piece). And, then there was that house fire! 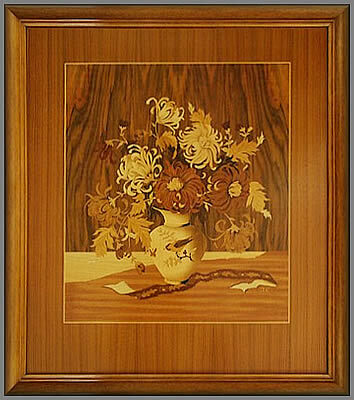 Our August 2010 update brings a wonderful tale of an owner's (Sue & Tim Williams) adventures (shall we say) in the acquisition and ownership of a much loved Buchschmid and Gretaux wood Inlay picture. "I, too, own this beautiful piece in reasonably close dimensions to the ones you described. The dimensions of my piece appeared to be the same as yours I saw online, but I've measured and find them to be quite different in certain places. The actual picture portion of mine is 18.5 inches across and 20 inches high. With the "frame" around the picture (which is 3 inches sides and top and 4 inches on the bottom) and the actual frame in which it sits (which is about 1 1/2 inches wide), the overall size is 27 7/8 inches wide and 30 3/8 inches high. This piece was sold with "frame" - that refers to the 3 inch sides, top, and 4 inch bottom or without. I never saw a piece that didn't have the same 1 1/2 inch actual frame (as we know it) that surrounds the piece. I first fell in love with it when we were stationed in Schwabisch Hall, Germany (1964- 1966). Upon my return stateside, I kicked myself for not having purchased it and said if I ever returned it would be the first thing I would purchase. Well, fate allowed, and we returned and were assigned to Zweibrucken with a six-week interlude in Neubrucke. 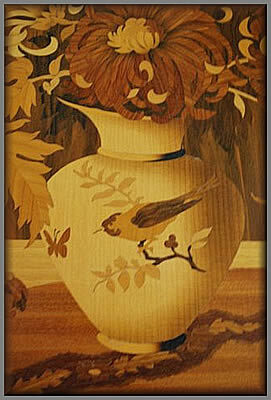 The second day I was there, a display of B & G wood inlays greeted me when I walked into the Officer's Club. I asked about the Chrysanthemums - did they still exist? I believe the man was the nephew of Herr Buchschmid (relative anyway), and he said they had *one* more that was in Stuttgart, and it would be the last piece that Herr Buchschmid had his hands in the making of, and that no more were to be made - the business was on the wane as age and infirmity precluded much of this work to continue. However, I'm not one to actually say that there weren't more made or sold after June 5, 1970 when I purchased this one as shown in the pictures. He then told me that family members would sit around tables and put together the "parts of the puzzle." The picture cost $150 because it's considered "with frame", and the table was $75. Both were high prices for a young Captain in the U.S. Army. 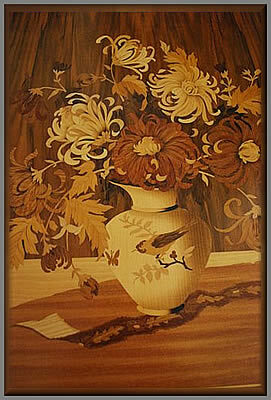 Our home burned down in 1996, and I was heartbroken when I couldn't find "my Chrysanthemums." However, seven months later, when our reconditioned furniture was delivered to our re-built house, guess what came off that truck and brought joy back into my life?! I love it, and nothing could make me part with it! Thanks for letting me share my story." Thanks ever so much for sharing your wonderful story with us Sue. We are so pleased to see that you got your picture back after it looked like you'd lost it in that dreadful fire. 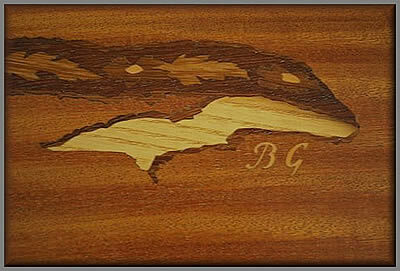 We do hope you continue to get many more years of enjoyment from such a lovely and desirable piece of B & G craftsmanship. Readers, if you have a similar heart warming B & G story of your own, why not get in touch and tell us. We would love to hear from you, thanks.
" Detail View of Design"
" The picture taken in slightly different lighting"
Click the above button to return to page 26 of "Can You Help"